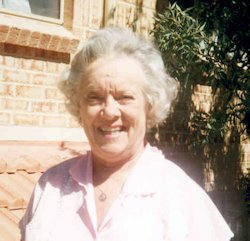 Phyllis Masters passed away on Sunday 9 July 2006 in Glengarry Private Hospital located in Perth, Western Australia. 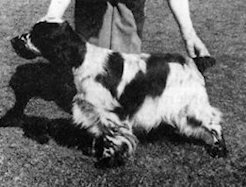 Phyllis was well known for her kennel of Styvechale cocker spaniels of various colours from the 1940s right through to the 1990s. During those years, Phyllis served on the committee and was a Life Member of The Cocker Spaniel Club and enjoyed taking part in fund-raising activities for the parent club’s Rescue welfare by organising a bric-a-brac stall at various shows. 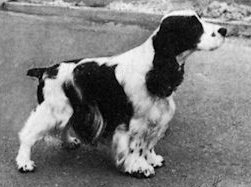 For a short time in the 1970s, Phyllis was Secretary to the Coventry Cocker Spaniel Club and in 1971 was one of the founder members of The Parti-Coloured Cocker Spaniel Club and from then onwards remained an active officer/committee member to that Club. After emigrating to Perth in August 1993, Phyllis was officiated with the title of Patron and Honorary Life Member. In the early 1980s, with her devotion, honesty and professional integrity, Phyllis put forward her Sh Ch Chrisolin Cambiare of Styvechale for tests to prove the fatal congenital kidney disease, FN. The tests proved Cambiare was a carrier, resulting in his early retirement (he lived to a grand age of 14yrs). Although some tried to blame Cambiare - certainly he was neither the first nor last cocker in giving problems - it was Phyllis’ own responsibility to help reduce this problem as was possible, and for the important virtues of cocker spaniel posterity. Although they were difficult times, Phyllis with her intelligence found a solution with an outcross and so producing the top sire, Styvechale Stormcloud, and over the years he went on to producing some champions. Indeed at that time, the lines of Styvechale played an important role in the success of top winning cockers from other well known kennels today. Mark Boswell (Marquell) writes “Phyllis was a great mentor to many people just starting out with a show cocker. I being one of them, at 17 yrs old, Phyllis took me under her wing and guided me along the road to showing and breeding cocker spaniels. I spent many happy weeks with the Styvechale kennels at Valley House. Phyllis was so proud on my Best of Breed with Sh Ch Marquell Misprint at Crufts 2005 and was one of the first to send congratulations”. My personal involvement with the Styvechale kennels happened in the early 1980s and from that time, Phyllis and I grew a ‘mother & daughter relationship’, sharing her vast breeding knowledge and experiences, hand-trimming techniques, general cocker spaniel guidance, and in the later years I was asked to handle Styvechale cockers at shows - we had many good hours trimming and preparing for the shows. Even after the day when Phyllis emigrated to enjoy a happy retirement in Perth, Western Australia, to live close to her eldest son Brian and his family, and where she was visited by her younger son Graham and his family who live in California, we kept in regular contact and I visited her on two happy and memorable occasions. Many people would say that Phyllis was a kind and welcoming person when visiting the Styvechale home; indeed she was a devoted lady who gave so much to the cocker spaniel fraternity and I am eternally grateful to have known Phyllis in my early years of cockerdom.